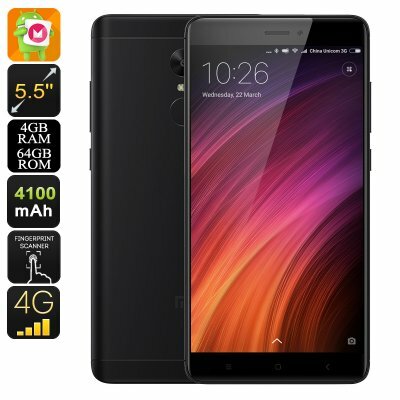 Successfully Added Xiaomi Redmi Note 4X Android Phone - Deca-Core CPU, 4GB RAM, 4G, Dual-Band WiFi, Android 6.0, Dual-IMEI, 5.5-Inch (Black) to your Shopping Cart. Meet the Xiaomi Redmi Note 4X – a sleek Android phone that treats you to an exceptional user experience. With its epic Deca-Core processor that has been clocked at 2.1GHz, this Android smartphone puts forth a stunning performance. Along with its powerful CPU comes 4GB RAM and 64GB internal storage. Together, this hardware lets you enjoy all the latest and most demanding software features available. Whether it’s games, movies, or Apps – nothing is too much for this Android phone. With its Dual-IMEI numbers and 4G, the Xiaomi Redmi Note 4X brings along great connectivity. You will be able to take advantage of the fastest mobile data speeds out there and always are reachable on two phone numbers. Thanks to this, the cell phone is great for busy people that wish to separate their work and private life in one phone. Additionally, it comes with Dual-Band WiFi. This means that you can browse the web and download files at lightning speeds whenever you’re at home or in the office. On the phone’s 5.5-Inch FHD display, you’ll be able to undergo a breathtaking visual experience. It lets you experience vivid color and stunning detail while playing 1080p media. Along with the phone’s 4100mAh battery, you’ll be able to watch films and play games for up to 8 hours in a row. The Note 4X comes with 64GB storage and an SD card slot that supports up to 128GB. This means that you’ll always have plenty of storage available to keep your files, media, and the photographs taken with your phone’s professional-grade 13MP camera. The Xiaomi Redmi Note 4X comes with a 12 months warranty, brought to you by the leader in electronic devices as well as wholesale Android phones..